CAN Isolator click provides isolated CAN communication. It carries the ADM3053 signal and power isolated CAN transceiver with an integrated isolated DC-to-DC converter. The click is designed to run on either 3.3V or 5V power supply. CAN Isolator click communicates with the target microcontroller over UART interface. The click carries a DB 9-pin male connector. The ADM3053 is an isolated controller area network (CAN) physical layer transceiver with an integrated isolated DC-to-DC converter. The ADM3053 creates a fully isolated interface between the CAN protocol controller and the physical layer bus. It is capable of running at data rates of up to 1 Mbps. 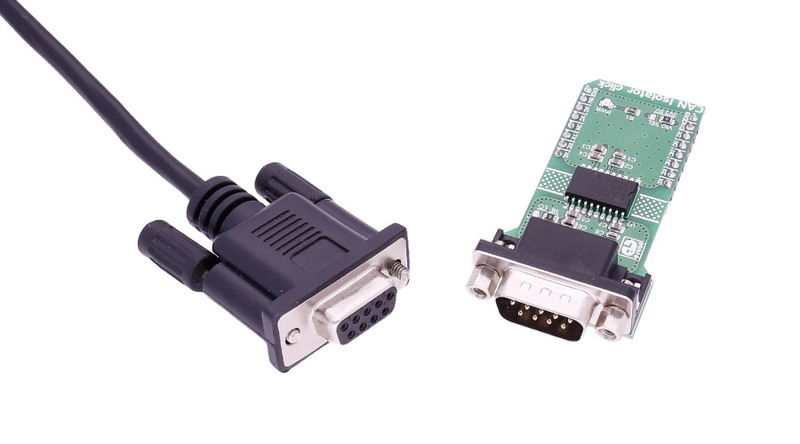 This is a standard DB 9-pin male connector. This table shows how the pinout on CAN Isolator click corresponds to the pinout on the mikroBUS™ socket (the latter shown in the two middle columns).